Sudanese poet Afeif Ismail Abdelrazig was a part of Overload’s bilingual‘Universal Tongue’ event. Afeif was born in Elhassahisa, Sudan in 1962. 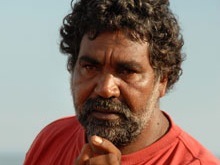 A published poet writer, playwright, artist and human-rights activist, he arrived in Australia in 2003. Afeif’s plays (in Arabic), published in Sudan between 1986 and 2000, include The Race, Doors, The Merchant, Starvation and The Centre of the Circle. He was short-listed for the inaugural Kit Denton Fellowship for Writers of Courage in 2007, for which he submitted his plays The Son of the Sun, The Maze and The Shrouds or the Dead. Afeif has published many works of poetry in English, Japanese and German: Traps and Some Tracks in 2001, Bet of the Argil in 2003, A Passage to the Aroma of Invisibility in 2006, and It’s your Bird in 2007. Here, Afeif performs live at Cottonmouth translated by fellow poet Vivienne Glance, another Overload star. Listening to the rise and fall of Afeif’s rumbling words and Vivienne’s articulate translation makes us Overland Overloaders wish we could have been everywhere this Overload. The setting was an unlikely one for a major festival event: the stark community hall of the Atherton Gardens Estate (commonly reffered to as ‘the flats’). In the middle of Ramadan, on a Sunday night (also Fathers’ Day), attempting to draw a local Muslim audience was always going to be a challenge. Unfortunately the residents of the Atherton Gardens did not come. On the up-side a generous audience of 30 or so found their way and they were not to be disappointed! Ahmed Hashim (Melbourne / Iraq), Afeif Ismail Abdelrazig (WA / Sudan) and Atief Khieri (ACT / Sudan) performed their work in Arabic with the aid of Vivienne Glance (WA) and James Waller (Festival Director) delivering English versions. Ahmed Hashim opened the evening with a series of pieces that touched – with black irony, pathos and transcedent humour – the devastation of his homeland Iraq. Hashim closed out his set with a sequence of powerful haiku – each one as light and as strong as a suicide bomb. The contrast in Hashim’s work, between the every day and the horror of war, spoke like a true picture, a sublime utterance, defying by its very existance the stupor of despair. Atief Khieri followed with a short set in both Arabic and English. We were moved by the emotion with which Khieri carried his voice, poignant and filled with ‘syllable-pain’ (Celan). It is a pity more Arabic speakers were not present to fully appreciate the largely non-translated verse. We certainly look forward to seeing more of Khieri in the future and pray more of his pieces find their way into English. Closing out the evening was the towering Afeif Ismail Abdelrazig and his co-translator Vivienne Glance. Performing in tandem, between Arabic and English, Abdelrazig completely charmed and moved his audience aided by the wonderful English delivery of actor-trained Glance. Abdelrazig’s poetry is one haunted by absences, yet buoyed by a love of story and a penchant for magic. His philosophical chants of being reached out across continents and languages on this very special night of the universal tongue. The night was rounded out by some delicious Sudanese food prepared by Jazeera restaurant in Footscray. As Overload’s first bilingual showcase it was an encouraging beginning and we look forward to many more in the years to come! Our partcular thanks to Jesuit Social Services for sponsoring the event. It was indeed a wonderful night. This is the one event I’m absolutely gutted about missing. I have to say that I’ve been really impressed with the diversity of poets this Overload. To have shared the stage, in one gig, with Ali Cobby Eckermann and Lewis Scott almost brought me to tears. 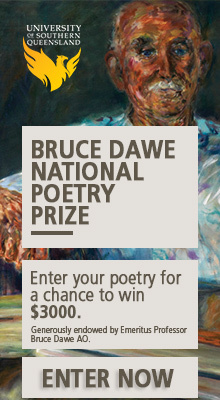 Poetry can all get a bit ‘one voice’ in Australia sometimes, and this has certainly not been th case during Overload. So to James and the programming team: well done and thankyou. Some of Afeif’s bilingual edition books are on sale during Overload at Collected Works. Fantastic Luis – I’m going to head over there. James mentioned the possibility of an Overload Library last night. I think it’s a brilliant idea. I’ve already bought 3 books and 2 cd’s from fellow poets this Overload, and I’m loving ALL of them! Afeif is a truly inspirational man. If you have not already, you must check out his words. Someone mentioned in a comment to an earlier post that there are regular Persian language readings around Melbourne. Seems like months ago even though it was only last week. Can anyone give details? I’d love to go and check out some readings. I don’t speak Persian, but the music of poetry can still be transcendent. I remember listening to poems in Québécois in Montreal and being blown away even though I don’t speak French. You can still get a sense, the feeling, the spirit of it, even without translation. Thankfully though, Afief has a great translator so we get to enjoy his work in both languages. Thanks for the link to the Cottonmouth site – love those crazy kids.